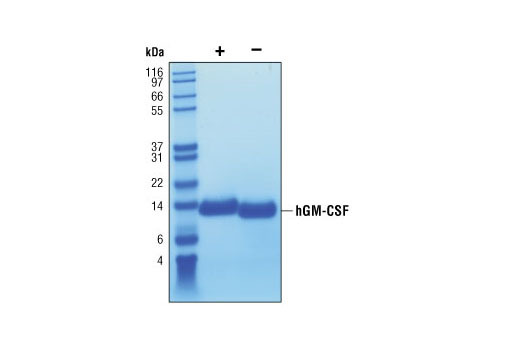 The purity of recombinant hGM-CSF was determined by SDS-PAGE of 6 µg reduced (+) and non-reduced (-) recombinant hGM-CSF and staining overnight with Coomassie Blue. The proliferation of TF-1 cells treated with increasing concentrations of hGM-CSF was assessed. After 48 hour treatment with hGM-CSF, cells were incubated with a tetrazolium salt and the OD450 - OD650 was determined. 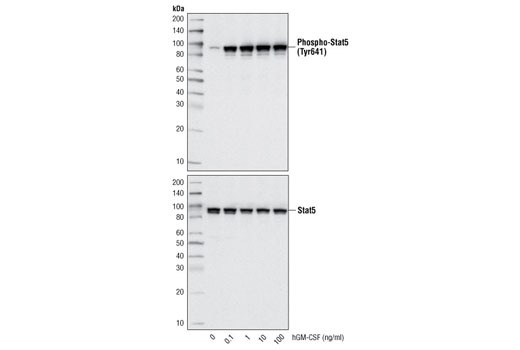 Western blot analysis of extracts from TF-1 cells, untreated or treated with hGM-CSF for 10 minutes, using Phospho-Stat5 (Tyr694) (C11C5) Rabbit mAb #9359 (upper) and Stat5 (3H7) Rabbit mAb #9358 (lower). Recombinant human GM-CSF (hGM-CSF) Ala18 - Glu144 (Accession # NM_000758) was produced in E. coli at Cell Signaling Technology. >98% as determined by SDS-PAGE of 6 μg reduced (+) and non-reduced (-) recombinant hGM-CSF. All lots are greater than 98% pure. Recombinant hGM-CSF does not have a Met on the amino terminus and has a calculated MW of 14477. DTT-reduced protein migrates as a 14 kDa polypeptide and non-reduced protein has slightly greater mobility due to intramolecular cystines. The expected amino-terminal APARS of recombinant hGM-CSF was verified by amino acid sequencing. 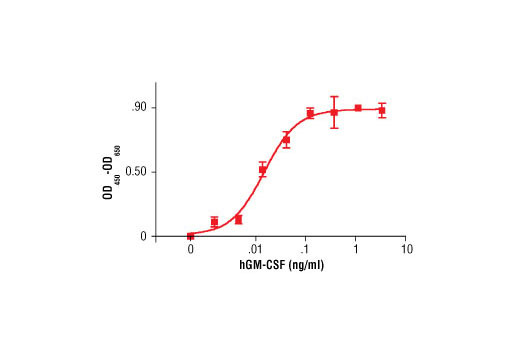 The bioactivity of recombinant hGM-CSF was determined in a TF-1 cell proliferation assay. The ED50 of each lot is between 5-500 pg/ml. Less than 0.01 ng endotoxin/1μg hGM-CSF. With carrier: Lyophilized from a 0.22 μm filtered solution of PBS, pH 7.2 containing 20 μg BSA per 1 μg hGM-CSF. Carrier free: Lyophilized from a 0.22 μm filtered solution of PBS, pH 7.2. GM-CSF is produced by activated T cells, NK cells and macrophages (1,5). Target cells include granulocyte, monocyte precursors and subsets of differentiated myeloid cells (1,2,3). Many target cells require GM-CSF for survival. GM-CSF induces proliferation, is involved in hematopoietic differentiation of dendritic cells and is a key factor in differentiation pathways leading from stem cells. GM-CSF activates effector functions of myeloid cells, thereby linking adaptive and innate immunity and in turn may boost anti-tumor immunity (4). GM-CSF receptor is composed of GM-CSFRα and the common β chain, βC, which is also utilized by IL-3 and IL-5 (1). Binding of GM-CSF initiates the Jak2, Stat5 and PI3K/Akt pathways (1). Guthridge, M.A. et al. (1998) Stem Cells 16, 301-13. Sonoda, Y. et al. (1988) Proc Natl Acad Sci U S A 85, 4360-4. Sonoda, Y. et al. (1988) Blood 72, 1381-6.
de la Cruz-Merino, L. et al. (2008) Oncologist 13, 1246-54. Zhang, A.L. et al. (2007) Blood 110, 2484-93.